For years, running was my go-to for working out my body, alleviating stress, and helping me achieve more restful sleep. I loved that time to myself to listen to music, pray, or reflect. But then I hit a wall and found that it was becoming more and more difficult to achieve the results I wanted. I was advised to incorporate some yoga or strength training into my routine or change up my cardio, so lately I’ve been holding my downward dog position in 95 degree temperatures or jabbing and hooking my way to a stronger core. A quick Google search will provide thousands of how-to articles (some backed by science) on post-workout recovery. It wasn’t until my shoulders were so sore after a strength training class that I couldn’t pick up my purse, that I started getting serious about stretching, resting, hydrating and fueling up on nutrient-rich foods. It takes every ounce of discipline after a workout not to indulge in my favorite foods. There is something about that post-workout endorphin rush that finds me justifying everything from pancakes to dark chocolate and ice cream. Since weight loss is 75-80% diet, making smarter dietary choices combined with fitness can ideally result in significant progress. The latest change to my morning routine includes the addition of a post-workout shake or a Balance Bar. If you’ve ever met me, you know that dark chocolate is my favorite indulgence and I always have a supply on-hand when I’m craving something sweet. But rather than snack on empty calories, I’ve been keeping a supply of Dark Chocolate Pecan Turtle Balance Bars in my purse for my post-workout recovery snack. At just under 200 calories, I can get in nearly a third of the recommended protein I need and a serving of fiber while satisfying my cravings. 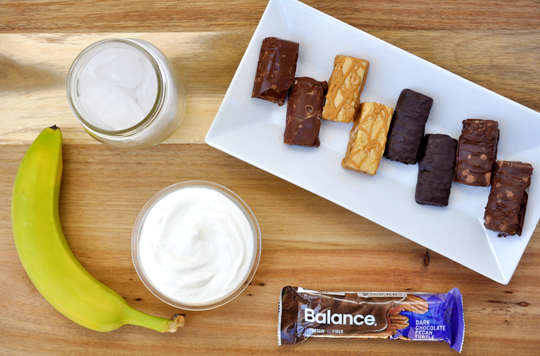 For my post-workout recovery, I’ve been blending my favorite Balance Bars with Greek yogurt, a banana and ice for a refreshing and satiating between-meals snack. Here is my recipe for a Dark Chocolate Banana Post-Workout Shake! This shake is packed with lean protein, fiber, potassium, and probiotics. It tastes like a decadent chocolate milkshake minus the fat and sugar. 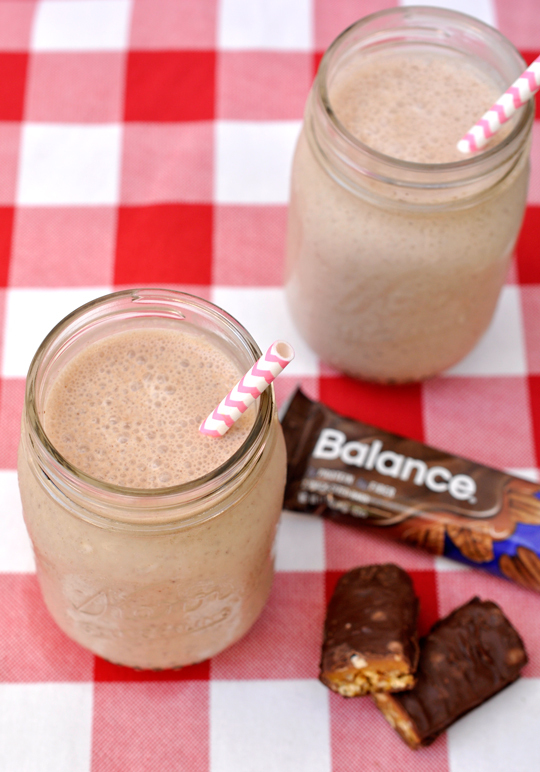 You could easily blend your favorite fruit or veggies with a Balance Bar and some yogurt for other variations on this Post-Workout Shake. If you’re striving towards fitness and health goals but feel like you have to deny yourself the things you enjoy (like chocolate! 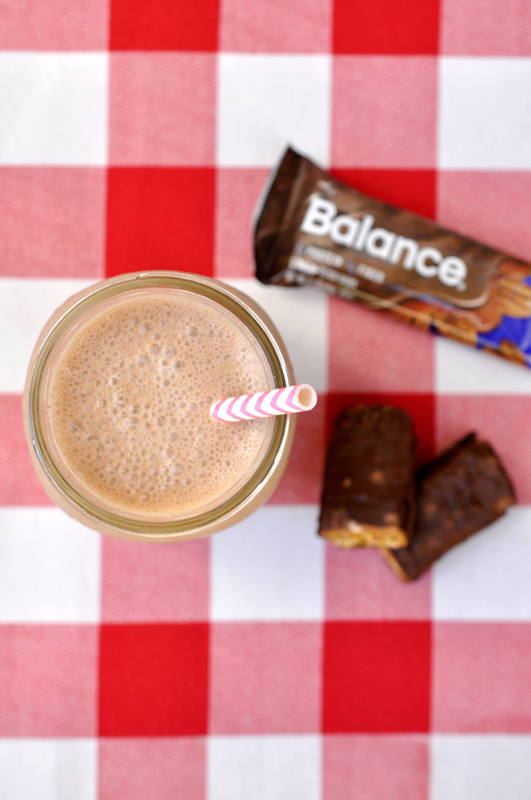 ), Balance Bars are the snack that you can crave-freely while still taking in important nutrients your body needs. I strive to live by the rule of “everything in moderation,” particularly when it comes to fitness and nutrition. I’m more successful when I allow myself those small cravings without giving in to the temptation to eat an entire pint of ice cream or living on kale and water. Available in regular and mini bars, I keep one in my purse and workout bag for smart snacking on-the-go. Each bar is 190 calories or less, contains 5-7 grams of protein and 5-6 grams of fiber. With flavors like Chocolate Caramel Peanut Nougat, Chocolate Peppermint Patty, Dark Chocolate Pecan Turtle and Dulce De Leche & Caramel, you can snack guilt-free. 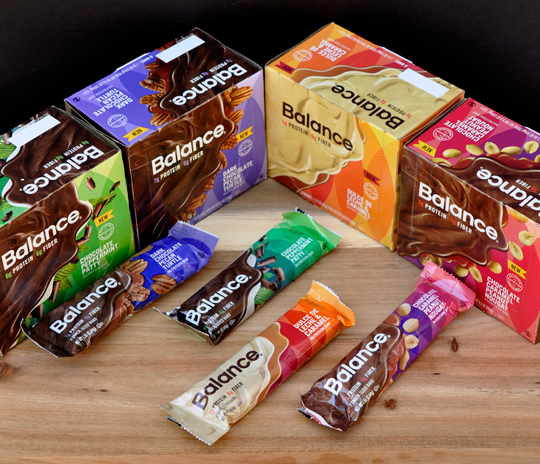 Balance Bars are available at Walmart or online at Amazon.com. To keep up-to-date with the brand, visit on Facebook, Twitter, and Pinterest.